Four 150g bars of chocolate eaten in one sitting, bags of triple chocolate cookies, packets of kit-kats - "the healthy option," pizzas and garlic bread all washed down with litres of lucozade. I feel embarrassed to think that person used to be me only 12 weeks ago. This was what the worst of my postnatal diet looked like. As my daughter became interested in watching me eat. I suddenly found myself looking at what I ate and thinking would I want Poppy to eat like this? The first step for me was actually deciding to do something about it. Although it took me a few weeks to work up the confidence to email Kate and get started. When I met Kate one of the questions I asked her was "If I do this how are you going to keep me motivated?" Kate answered matter of factly "I'm not. You are going to motivate yourself, I'll just support you." This changed my thinking from - this is a quick fix thing and if I can't do it it's not my fault - to deciding to focus on being healthy, take responsibility for my health and to choose to make a new way of life for our family. I decided, on Kate's advice that rather than say I'm on a diet which for me seems like deprivation and something to do to achieve a fast result. I would call it having a healthy focus, this felt unrestrictive and positive. Kate put me on the my fitness pal app to get my portion size under control - I'd used this app before and always found a way to cheat it, either by eating lots of chocolate but skimping on real food to keep under my calorie goal or by guessing amounts. This time I made a decision that if I was doing it, I was doing it properly. So I got some digital scales, recorded every single thing I ate and drank and got really into balancing my macros. After being on the app for a while I started to think that maybe I'd become a little obsessive. That didn't fit in with our "healthy focus" idea, so I spoke to Kate about it and she suggested I try a week without inputting and see what happened. Coming off the app was really daunting as I thought I'd balloon up again because I didn't know what I was eating. However I found that using the app had just taught me what I should be eating and how much of it was a good amount to have. Another thing Kate tackled was my lack of exercise. I came to Kate naively thinking that, the one day a week training with her would transform my body and I wouldn't need to do anything in between! Ha not true! I was quite shocked when Kate suggested doing the couch to 5k app, "what running, err no." Was my first thought? However I got the app and started running. On my first run I tried to go really fast and got stitch in the first 3 minutes, I rang Dave thinking he'd say "oh poor you, come home and rest". He didn't. He encouraged me to keep going even if I did it really slowly. I completed that run and didn't give up, (as was habitual for me) that was another turning point. I promised myself that no matter what I would complete each run and that "I'm tired or achy or even have stitch" etc. were not valid excuses for not sticking to my runs. I've slowly become a person who doesn't just tolerate running; I'm actually starting to enjoy it! I also have started walking more with the pram. When I suggested "healthy focus" to my husband he was keen to join in on the condition that we still had treats and that he was never left feeling hungry. So I bought a book and started learning how to make healthy treats for us. Banana pancakes really got him on board! My husband has been so supportive of me doing this that he has gone down two belt sizes himself! I’ve had a couple of new revelations during these 12 weeks. The first was to realise that I don't need to binge eat a whole packet of anything; it will still be there tomorrow. The other is when I've had a treat and I start reaching for more I say to myself "you are not that person anymore". Even though I was unhappy with my previous size and lifestyle, I was comfortable. I'm now learning to leave that comfort and to get comfortable with the new healthier me. I'm so grateful to Kate and my husband for all of their support and I never thought I could have achieved this! While I was on holiday I received a lovely text from Elly.... her little girl is now 18 months (14 months since we started her healthy focus). She is a real inspiration to everyone, not just postnatal mums....Elly has continued to keep active regularly and the results are fantastic JUST LOOK AT HER ABDOMINAL DEFINITION WOW!!!!! Elly changed her food habits and her found healthy eating enjoyable... investing the time to cook healthier foods and adds regularly to her recipe collection. 'I went to a party last night and saw friends I haven't seen in ages, I got so many compliments also apparently I look better now than before I was pregnant hehe! Thank you so much for investing your time into helping me! I feel incredible now and I'm having a healthier lifestyle! 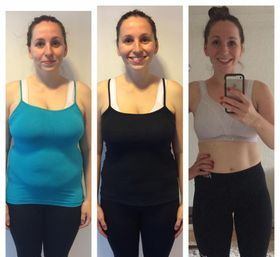 Love Elly "
After having my twin boys, my body had changed shape dramatically and I desperately wanted to lose the excess fat I had gained. I knew I had a challenge on my hands and I was at a loss not knowing how to do it. I started dieting, but after day 3 I was miserable (I love food too much). So I contacted Kate for guidance and it was the best thing I did! From our first meeting to our last training session she has been incredible - supportive, motivated, helpful and patient. I have learnt so much in terms of dieting, nutrition and exercise which will help me in the long term. Thank you so much Kate! Your Back to Basics - 8 week weight loss plan has been brilliant! 11lbs lighter and 9 inches of fat lost! I feel like me again and can even run for more than 5 mins! I feel great and my confidence has soared!!! You've even made me consider having another by showing me that it is possible to get back in shape after the second and subsequent babies! It's not just your knowledge but your bubbling enthusiasm that was so key to keeping me going! After my first session I knew new muscles had been awoken! By the end of only my second session, I noticed positive changes in my physique, posture & overall core strength. Over the sessions these improvements continued as Kate encouraged me to push harder. On top of all of those benefits, I met some great people at the boot camps which always helps to make training more enjoyable. Many people there had similar targets for their training, others were more focused on specific fitness areas they wanted to develop. And this is what makes Kate's classes so unique - she has the ability to deliver a personal fitness session to everyone there, even as part of large group. For me, my core was the focus, for others, running, upper-body strength, legs whatever it was as part of a 45min session everyone came away knowing they had trained hard and taken a massive step closer to achieving their individual goals. Kate has a passion & desire for healthy lifestyles, training, fitness & ultimately helping people meet their own personal fitness goals. I cannot recommend Kate and her classes enough. I am 66 years old and had chemotherapy over the winter months. The treatment, whilst successful, left me feeling very low and unfit to a point where even the smallest task seemed impossible I contacted Kate and we decided my aims were to be able to manage a bowls match, garden and play with the grandchildren without becoming exhausted. Kate gave me goals each week that were not only achievable but worked with my lifestyle. She encouraged me constantly and slowly I achieved my goals. At long last I can bowl, play with the children and have just finished the garden. Thanks Kate. I first met Kate when I joined her antenatal classes back in 2011. I was never a real fitness fanatic but I wanted to meet some friends and also be fit enough for labour. I survived the labour and have been lucky enough to make a load of friends who have helped me keep sane through two pregnancies and bringing up two gorgeous little boys. With hindsight I was over eating, but with two pregnancies close together and breastfeeding I had thought I’d be okay. Nine months after the birth of our second son I found myself over 2 stone above a healthy BMI and weighing more than I had before my first pregnancy. I decided I had to do something about it before my return to work. The answer for me was Kate’s 321 classes. I found that for the first time in my life I didn’t just give up and I built up my fitness over the 6 week course. In fact I found the exercises Kate taught us addictive and easy to replicate at home. With loads of support from Kate, I have now lost 2 stone 8lbs. More important to me than the weight loss, I now feel that I genuinely enjoy the exercise and that I can actually do it! The 321 classes really fit well into our lifestyle. The fact that the classes only last 30 minutes mean that even if the children are not very settled or if they wake then I can be home soon to help. I really like the fact that the 321 classes can be booked in blocks because it is the incentive I need to keep me going! Over the block of lessons you can really see an improvement in your fitness. I now attend the Saturday morning class and I love to stay for the abs blitz class straight afterwards (something I never would have felt able to do before!) So, by 9am I have done one hour of exercise and it’s the perfect start to the weekend. Thank you Kate! Kate’s Keep Mums Fit antenatal & postnatal classes are brilliant. It’s great that Kate’s also a midwife & can give such helpful advice , and the antenatal class is a good mixture of cardio, stretching and relaxation. As well as keeping fit, it’s made me more aware of posture and my pregnant body generally. It’s also a good way to meet other mums-to-be who generally follow through onto her postnatal classes – a unique benefit of Kate’s classes. Kate’s really helped me through both my pregnancies, & I recommend her classes to everyone I know who’s pregnant!